The British Information Commissioners Office (ICO) has confirmed that it intends to re-open the investigation into Google and its Street View project run between 2007 and 2010 as a result of the FCC's findings last month. The ICO had ended the probe after accepting Google's response that the collection of data was unintentional. However, in light of the recent findings by its American counterpart, the case has been re-opened. What is embarrassing for the ICO however, is the FCC's final report into Google's conduct on US soil highlights the UK authorities' naivety for taking Google's word for the "mistakes" at face value. In a letter addressed to Google, the ICO noted that the FCC had said data included "complete email messages, email headings, instant messages and their content, logging-in credentials, medical listings and legal infractions, information in relation to online dating and visits to pornographic sites". The ICO is now asking that a certificate be supplied confirming the destruction of the data captured, as well as further information regarding what type of data has been captured, when the managers became aware of the issue exactly and how it was managed from that point onwards. They are also asking for an explanation as to why the full range of data wasn't represented in the sample presented to them in 2010. 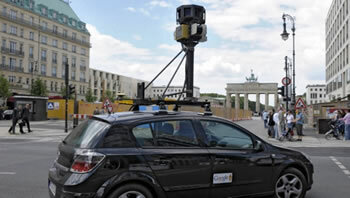 The move follows a Judgment (PDF) by a Federal Supreme Court in Switzerland last Friday, in which strict conditions were imposed on Google's Street View project. The ruling said that under certain circumstances, the collection of Street View images could be unfair, excessive and may need consent before use. In particular, the Federal Supreme Court ruled that any images indentifying schools, women's refuges, nursing homes, prisons, courts and hospitals must be rendered entirely anonymous before they can be made publicly viewable. In addition to this, faces or any characteristics which could identify an individual's skin color or ethnic race, including clothing, or the walking aids of disabled people must be rendered completely unidentifiable. The Swiss court also clarified several issues in relation to Swiss data protection law, which in many respects could offer the ICO a means of pursuing the internet search firm. Given the closeness of the Swiss Data Protection Law and the Eighth Data Protection principle of the UK Data Protection Act, it's entirely possible the ICO could cite the same conditions on Google. Google did not respond to requests for further comment at the time of writing.